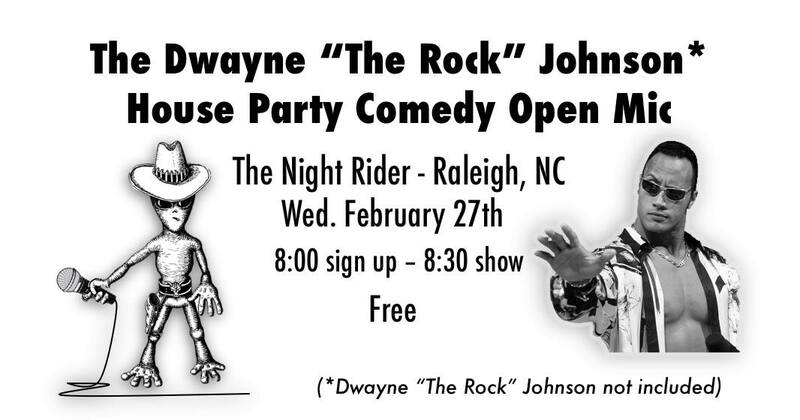 Join us at “The Night Rider” at 416 W. South Street, Raleigh, NC for the “The Dwayne ‘The Rock’ Johnson House Party Comedy Open Mic”. See some of the Triangle’s best comics work through their newest material. Join Reid Pegram as he hosts the hottest comedy open mic in downtown Raleigh. Think you got what it takes to bring the funny? Then we’ll give you three minutes behind the mic to do your thing.